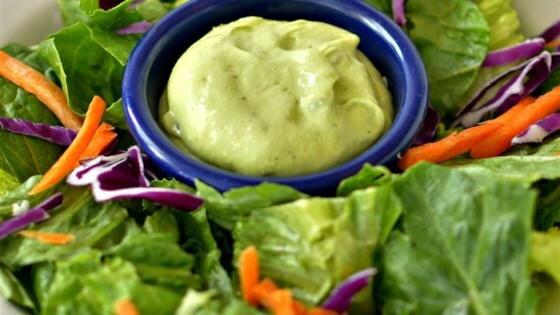 "I adapted this recipe from another recipe for avocado dressing that I wanted to make more healthful." Blend avocado, yogurt, olive oil, lemon juice, garlic, sea salt, hot sauce, and black pepper together in a blender until smooth. Canola oil can replace the olive oil, if desired. I found this to be lacking in flavor so I added extra jalapeno sauce. This has a consistency of a dip and works well as such. The combination of the yogurt and lemon juice was not to my liking. Also if you wanted it to be a dressing you needed to add more oil or water. Mine was a tan color. I used this dressing as a dip. I had fresh cilantro on hand and added some. It was especially tasty with cucumber spears and celery. So good! I used greek yogurt and it tastes amazing! I will make it again and again!! I might add a little cayenne pepper, just for a little kick. This dressing is wonderful! I love that it's so healthy, and it has a nice zip to it that makes a salad something to look forward to.